Here’s a festive & patriotic recipe for the Fourth of July that will be sure to put a smile on all your friends & family’s faces! Mix ground beef, red pepper, garlic, salt, and pepper in a large mixing bowl; divide and form into 16 patties. 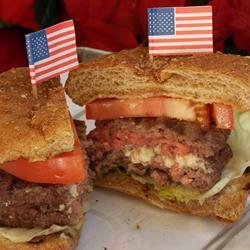 Place 1 ounce blue cheese in the center atop each of 8 of the patties. Top each cheese-topped patty with an unadorned patty, pressing the sides together so the cheese doesn’t fall out. Cook on the preheated grill until the burgers are cooked to your desired degree of doneness, 7 to 10 minutes per side for well done. An instant-read thermometer inserted into the meat should read 160 degrees F (70 degrees C).